Hey guys I am relatively new to this forums, I bought 2 samples of baystate blue from goulet pens. just need your input on it because I inked it up on my nemosine pen with a goulet M nib and the ink looks purple to me. for example like diamine majestic purple. I am using cheap paper but I tried it on good quality paper as well and I get the same results. I get a washed out purple with no saturation. Everyone talks about how bright this ink is but I sadly dont see it. Do you think I got a "bad" sample for some reason, I love goulet pens so I dont think they would make any mistakes. I tried samples a few years back and had the same problem. Or do you think I need the full bottle for somehow to get the full effect? Another thing, I found 2 reviews here on BSB first one is by Mafia Geek and that is how my ink looks like. In his review he says it is a bright blue but to me that looks like a purple color. Next review I found by Bubba Dog and this is how BSB should look like. this to me a in your face blue that I love but I dont know how these 2 users have such different outcomes in terms of color. They both used quality paper, Does the Nib size matter? thats the only thing I could think of. Bubba dog mentions he used a medium nib and I used a M nib too. Looks very purple to me too. BSB is a dead ringer for Blue Sharpie. If the Blue Sharpie looks purple to you, then you have the right ink. Amberleadavis - you've solved where I've seen BSB before!!! I never put that together in my head, it's like an ink revelation. I may go have to dig out my BSB and ink some throw away preppy with it. I'm, wow... I dunno. I'm something now. To me BSB looks purplish as well. I have side by side pics that I put up in fade tests. Until they are exposed to light.... indistinguishable. Yeah, BSB is on the purple side. I find it very saturated, in fact I dilute it to let more of the paper show through and decrease the purple. The "brightness" is misleading. It's not like highlighter. You probably won't see it with just a few words. But if you write a page full, and read it under good light, your eyes will not like it. 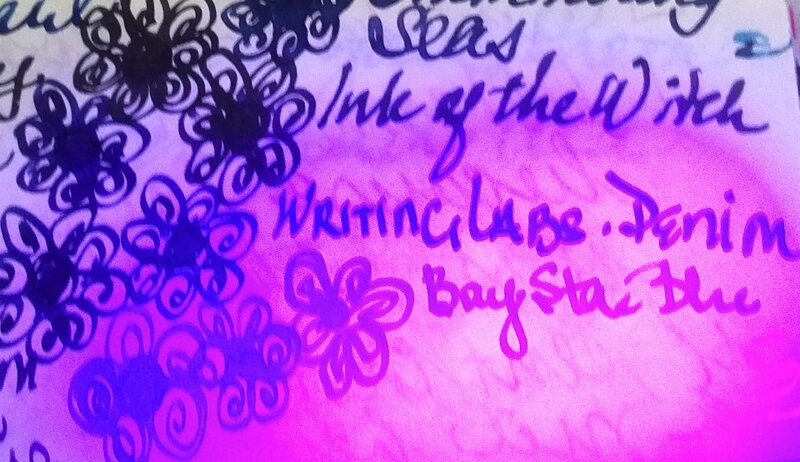 Amberlea, have you done a UV picture of Bay State Blue? I'm wondering if its vibrancy comes from being partly or fully fluorescent. Update: Yes, I found it in the UV thread and yes it does glow under fluorescent light. Edited by ErrantSmudge, 28 September 2018 - 04:00. I have a sample of Baystate Blue I bought the other week. I didn't see it as anything other than a primary blue before your post, predicting it was going to be a good match for an ultramarine primary blue, but when I actually compared it to the most saturated of my ultramarine blue watercolour paints I can now definitely see that it leans towards the purple side. 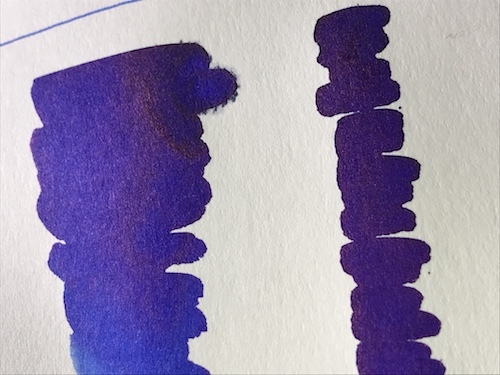 When brushed on paper heavily I can even see a red sheen on the ink, which I assume is creating this subtle purpling. I tried to capture it on my iPhone, but I probably haven't succeeded well enough for you to see onscreen. nice pics! yeah, i water down my bsb to avoid that deep dark top part of the swab. I also bought Liberty Elisium which is a purer blue to my eyes. Thanks Wallylyn, I can totally see what youre saying. The lower part of the swatch was diluted with water in an attempt to fade down to a lighter version and in that part of the swatch I see a purer blue with no purplish tinge and no red sheen on top. Remember that individual color perception varies, and that lighting is a critical part of color selection. What looks blue under a clear blue sky may very well look purplish under standard incandescent lighting which tends toward the red end of the spectrum..
That's why printers and other graphic arts specialists use a standard 5000 degree Kelvin light and a neutral gray surround when evaluating color. At the least, be sure you always use the same light to compare ink colors. it's super duper blue until you hold it against any other blue and then it's suddenly quite violet. I love this ink, as obnoxious and annoying as it is and as rarely as I use it. How BSB looks, like Tanzanite, for me depends entirely on what other colors it is next to. What you're experience is the result of poor quality control from one guy trying to do it all because he's too fricking cheap to hire employees for bizarro political reasons. This is precisely why I avoid Noodler's ink like the plague and will only buy samples of it. 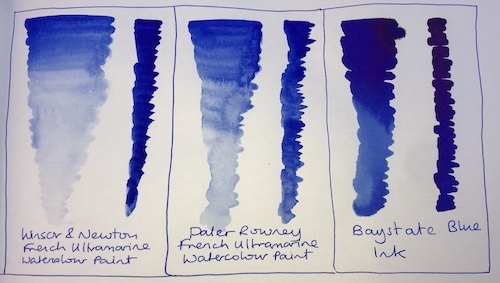 I once had the rare chance to compare my Air-Corps Blue-Black against that of 3 other people who I knew had it (I live in a heavily military city, so guess what ink is one of the most popular!). NONE of our inks matched in color or writing properties. Mine was absolutely a dark green-black, with hardly any blue in it. The others had varying degrees of less green and more blue, and definitely not as much black as mine. I had the very wettest ink of all of them, while the others had, again, varying degrees of less wetness. And mine smelled disgusting from something chemical in it. Theirs didn't. When four separate purchases of the same ink are that out of kilter with one another, that is the sign of absolutely unacceptable quality control. Which is why I do not buy nor recommend Noodler's inks. Some of them I really do like and would like to buy (BSB, Apache Sunset, Black Swan Aussie Roses), if I could have a guarantee that the samples I have will match the ink I get. But I can't trust their lunatic manufacturer to be that consistent. So I don't buy the inks anymore. I made that mistake twice (I also have a bottle of Concord Grape that is almost tolerable to keep around), and I'll never, ever do it again. Note: My sample of BSB (don't remember where I got it) is the glorious eye-searing blue that has made it so famous, but it oddly writes better on cheap nasty American paper and index cards than on the better paper like Rhodia! Other people can't get it to write on anything but Clarefontaine or Tomoe River properly. So again, the quality control simply is not there to justify buying anymore ink from the brand, at least for me. Edited by Aquaria, 22 October 2018 - 19:24. I'm not sure that blaming the ink right away is justified here. I know so many people who see things that are to me bright royal blue, and say they are purple. BSB actually varies very little in reality, although other noodlers are more variable. This one isn't. I would have to say that I'm in the same boat on BSB. I bought it after viewing samples of it on two different monitors (one on Goulet's site, and another sample on...Goldspot, I think? ), both of the samples posted seemed to show BSB to be this very vivid bright blue. I purchased the 4.5ml bottle from Goulet and ended up with a bottle of what is a VERY "royal purple" colored ink. I bought a bottle of Liberty's Elysium at the same time, despite it looking very similar to BSB online. Well, I needn't have worried, because LE is much more darkish/greyish blue. I will say that the Charlie pen that the BSB came with writes very well loaded with BSB, though it is a very heavy, dense, wet ink. I don't mind it, because I DO love the color, but do have to say that the color I got was not as perceived from the samples I'd seen online. Truthfully, I expected much more of a vivid blue running almost to electric blue or teal. One thing that's definitely as advertised, the entire interior of this Charlie is now BSB colored, which is ok because I won't be putting it into any other pens.